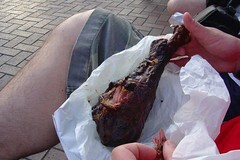 This turkey leg was so good. In the picture it looks very dark, even burned, but trust me, it wasn't. It was tasty. And huge. I'm back. Had a nice rest, then a holiday, and now I am sick. Oh well. Let me tell you some things I have seen and eaten. Went to Gospel Brunch at the House of Blues. The food was great and the music was even better. We had biscuits and gravy - I have never had that before and it was heavenly. We had biscuits and gravy at another restaurant on our holiday, but it didn't hold a candle to the HOB. Also had catfish for the first time. 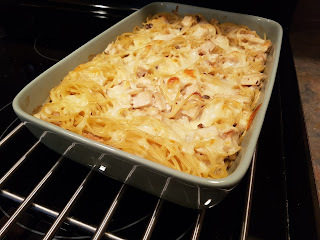 Macaroni and Cheese, which of course is totally different here (Kraft dinner, anyone?) and the best bread pudding with bourbon sauce. Sinful! We had an amazing dinner at Ralph Brennan's Jazz Kitchen. The building is gorgeous - it makes you want to run to New Orleans for a vacation. We listened to a great jazz combo, and the food was too good. Look at this menu! We had the sampler to start - except our sampler did not have the spring rolls on it. Oyster Shooters, coconut shrimp, Andouille sausage, and Creole calamari. It was all so good. For dinner Scott and I shared the Julienne of Beef appetizer (very good - the sauce was strong but tasty) and the Drunken Chicken which is not shown on the online menu. It was chicken breast marinated in rum and citrus, grilled, and served with spinach and a wild mushroom bread pudding. Incredible, especially the mushroom bread pudding. We had beignets and double chocolate bread pudding for dessert. The biggest disappointment of the trip was Tortilla Jo's. We went there I don't know how many times (at least 4 or 5) but after the first time we didn't order any more food, we just went there to drink. Here's a review I found. I agree and disagree with it - mainly disagree because I had the steak tacos and they were absolutely awful - greasy and cold, and no sauce or cheese or veggies. Just cold greasy meat in a flour tortilla. Scott had the Shrimp Ceviche from the menu and it was great. But all the other food, and especially the service were really bad. Most of our other meals were pretty run of the mill, but I have a great picture to post later of a huge Turkey leg Scott ate one day.